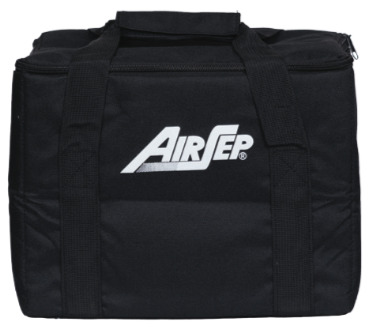 The AirSep FreeStyle Accessory Bag is the perfect case to keep all of your oxygen related accessories in. The compartmentalized interior allows you to easily organize and fit all of your accessories you may need. Whether you are flying across the country or taking a road trip to visit some friends, the FreeStyle Accessory Bag can make your life a lot easier. It is small enough to fit under the seat in-front of you on an airplane but large enough to fit all of your accessories and more. The duffle bag style of this accessory bag makes transporting it a breeze. You will never be scrambling to find your accessories again. This accessory bag has a specially designed interior with pockets for each accessory. There is even enough room to fit the concentrator.